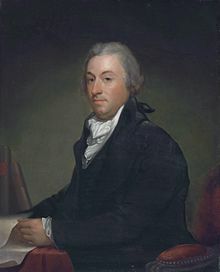 Robert R Livingston was a member of the Committee of Five, along with Thomas Jefferson, Benjamin Franklin, John Adams, and Roger Sherman. 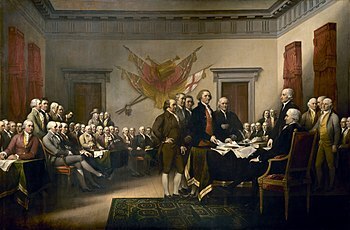 The Committee was tasked with drafting the Declaration of Independence. We have lived long but this is the noblest work of our whole lives ... The United States take rank this day among the first powers of the world. During his time as U.S. minister to France, Livingston met Robert Fulton, with whom he developed the first viable steamboat, the North River Steamboat, whose home port was at the Livingston family home of Clermont Manor in the town of Clermont, New York. On her maiden voyage she left New York City with him as a passenger, stopped briefly at Clermont Manor, and continued on to Albany up the Hudson River, completing in just under 60 hours a journey which had previously taken nearly a week by sloop sailboat. In 1811, Fulton and Livingston became members of the Erie Canal Commission. Through his eldest daughter, he was the grandfather of four: Margaret Livingston (1808–1874), who married David Augustus Clarkson (1793–1874), Elizabeth Livingston (1813–1896), who married Edward Hunter Ludlow (1810–1884), Clermont Livingston (1817–1895), who married Cornelia Livingston (1824–1851), and Robert Edward Livingston (1820–1889), who married Susan Maria Clarkson de Peyster (1823–1910). 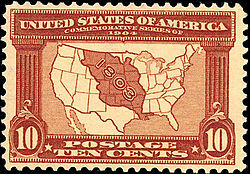 In 1904, the U.S. Post office issued a series of postage stamps commemorating the 100th anniversary of the Louisiana Purchase along with the central figures involved in this historical transformation of the United States. The engraved image of Livingston is taken from a Gilbert Stuart (1755-1828) oil painting of 1794. In the 2008 HBO miniseries, John Adams, Livingston is portrayed by actor Alex Draper. 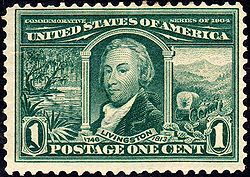 Livingston also appears in the Broadway musical 1776, where he is appointed to the committee for drafting the Declaration of Independence. In the film version of the musical, he is played by actor John Myhers. ^ At the time, the Livingstons used their father's first name as a middle name to distinguish the numerous members of the family, as a kind of patronymic. Since he and his father had the same name, he never spelled out the middle name but always used only the initial. ^ a b Livingston, Edwin Brockholst (1910). The Livingstons of Livingston Manor: Being the History of that Branch of the Scottish House of Callendar which Settled in the English Province of New York During the Reign of Charles the Second; and Also Including an Account of Robert Livingston of Albany, "The Nephew," a Settler in the Same Province and His Principal Descendants. Knickerbocker Press. Retrieved August 10, 2017. ^ "Livingston, Robert R. (1718–1775), [The Petition of Michael Theyser of the City of New York, Innkeeper]". www.gilderlehrman.org. The Gilder Lehrman Institute of American History. Retrieved September 11, 2016. ^ Robert R. Livingston, Encyclopedia of World Biography. ^ Schechter, Stephen L.; Tripp, Wendell Edward (1990). World of the Founders: New York Communities in the Federal Period. Rowman & Littlefield. ISBN 9780945660026. ^ Schuyler, John (1886). Institution of the Society of the Cincinnati : formed by the officers of the American Army of the Revolution, 1783, with extracts, from the proceedings of its general meetings and from the transactions of the New York State Society. New York: Printed for the Society by D. Taylor. Retrieved December 1, 2017. ^ a b The New York Genealogical and Biographical Record, Vol. XI. New York City: New York Genealogical and Biographical Society. 1880. Retrieved December 1, 2017. ^ Yasinsac, Rob. "Arryl House". www.hudsonvalleyruins.org. Archived from the original on March 31, 2017. Retrieved December 1, 2017. ^ "Clermont State Historic Site: Imagining Arryl House: Piecing Together an Architectural Masterpiece". October 25, 2013. Retrieved December 1, 2017. ^ "Obituary 1 -- No Title". The New York Times. December 14, 1898. Retrieved April 18, 2017. ^ "Death of Edward H. Ludlow". The New York Times. November 28, 1884. Retrieved April 18, 2017. ^ "G. LIVINGSTON DIES; LONG AN ARCHITECT; Practitioner Here for 50 Years Included Hayden Planetarium, Oregon Capitol in His Work". The New York Times. June 4, 1951. Retrieved June 6, 2017. ^ "Mrs. Susan de Peyster Livingston". The New York Times. February 11, 1910. Retrieved June 6, 2017. ^ Collins, Lewis (1877). History of Kentucky. p. 478. Bonham, Jr., Milledge L. "Robert R. Livingston". in Samuel Flagg Bemis, ed. The American Secretaries of State and their diplomacy V.1 (1928) pp 115–92. Wikimedia Commons has media related to Robert R. Livingston (chancellor). United States Congress. "Robert R. Livingston (id: L000372)". Biographical Directory of the United States Congress.